The difference between those who reach what they most want for their lives and those who don’t is simple: it’s commitment. So how do you commit so it sticks? 1. Decide that whatever you’re pursuing matters deeply to you. If something deeply matters to you, that’s reason enough to pursue it. You don’t need permission or an explanation or to justify. And it needs to deeply matter to you for whatever reason (even if it’s just for your enjoyment), otherwise you won’t be motivated to see it through all the way to the end. If you’re not willing to commit to something long-term, well, that’s a sign and an answer too: maybe that thing you’re pursuing isn’t something that you truly want to be doing. And if it isn’t, that’s okay; give yourself permission to let it go now instead of wasting your time on something that you may (likely) give up on in the future. 2. Make an unbreakable promise to yourself. Keep your word to yourself every single time. Do that, and you’ll come to trust yourself implicitly. And you’d be willing to commit to someone you trust, wouldn’t you? Somebody you knew would have your back no matter what? Someone who you could count on to show up and do what needs to be done? You need to be that rock-solid-foundation person for yourself. 3. Take the loopholes out. Any agreement/contract with an escape clause built into it isn’t worth the paper it’s written on. Why? Because when the going gets a little tough and a couple (or maybe even one) challenges get thrown at you, an escape clause gives you permission to quit. So you need to get rid of, right now, any loophole that lets you out of the commitment/deal you’re making with yourself. A loophole can’t be there at all, not even a little bit, because if it is, that escape clause will echo around in the back of your mind and will allow you the choice to shrink back and give up instead of rise up and do your very best when obstacles get thrown in your path. 4. Know that you’re making this commitment to yourself and not to anyone else. 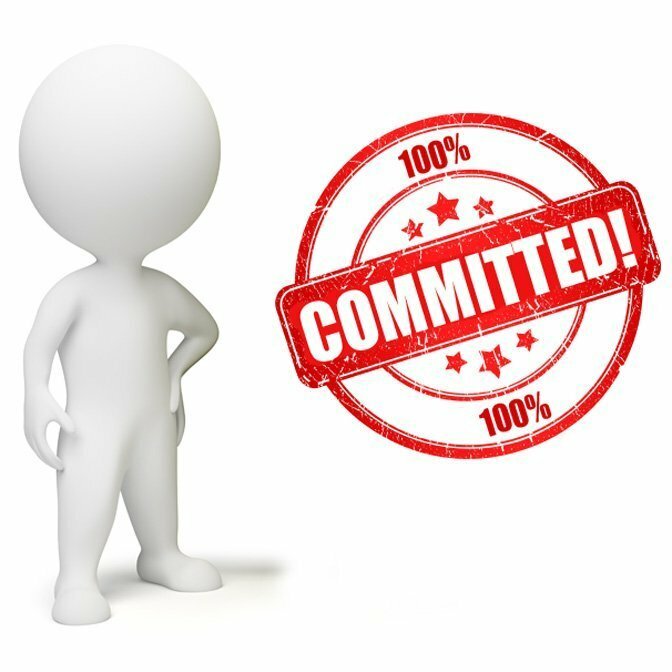 The commitment you’re making is to yourself and for yourself, regardless of what kind of commitment it is. You might be committing to do something for someone else, but there’s still a promise there that you, yourself, will see it though. No matter what you agree to, make sure you check your motivation and understand that you are committing for you and you alone, because whatever you’re doing matters deeply to you. 5. Decide, right now, what you’ll do when challenges come. You’re going to get hit with obstacles at some point; that’s not a matter of if but of when. You need to choose, right now, before you commit, what you’re going to do when that time comes. You need to decide the nature of your commitment—fleeting or forever—up front so that when the time comes, you can act accordingly. And always remember: challenges are inevitable, defeat is optional. 6. Put your blinders on. You will find whatever it is you’re looking for. Look around for obstacles and you’re going to find them. Look around for reasons why not and you’ll find those too. It’s easy to get distracted, especially when there are so many other things vying for your attention. That’s why when you commit, really commit, to something, you need to hone your focus to that one thing. Horses wear blinders to keep their focus on the road and not on anything that might distract/frighten them. You need to do the same, and not just for visual cues but for anything that might slow your enthusiasm and your progress. 7. Keep going all the way to the end. The most important part of commitment is finishing. You will never come to trust yourself if you don’t finish what you start (that is, if what you started deeply mattered to you to begin with). I’ve said this before, but it’s important enough that it bears repeating: make no mistake, finishing is about you and you alone. You will prove some things to yourself (read about them here), but most importantly, you will prove to yourself that your word and your commitment to yourself matter. Do what you say you will do and you’ll crush self-doubt and strengthen your (soon-to-be-unwavering) belief in yourself. So what will you commit like a boss to today?